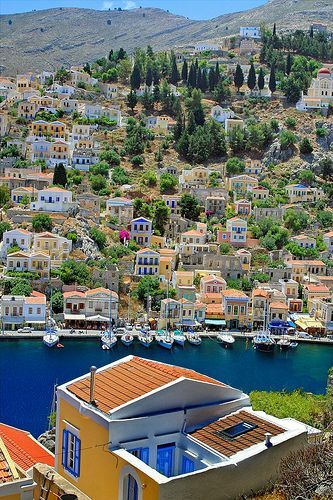 Symi is one of the most beautiful islands in the Mediterranean. It is famous for its Town, a “jewel” with the hundreds of colorful houses, masterpieces of local architecture. 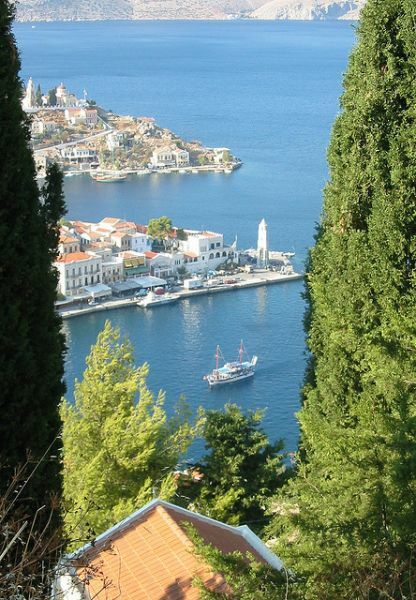 It is built up to the steep slopes above the picturesque port, offering breathtaking views. 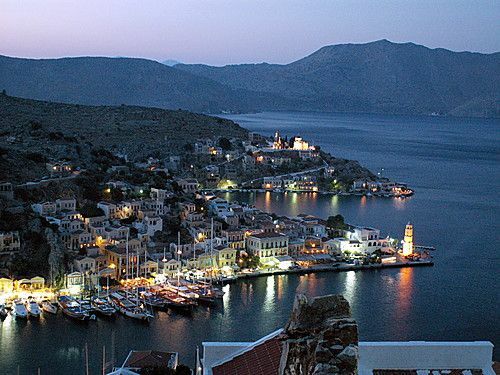 The walk to the upper town during the sunset, is definitely one of the best things to do in Symi. You will pass by beautiful neighborhoods and you will find one or two cafes where you can enjoy a drink, while admiring the magnificent view. An equally beautiful walk, however, is along the long quay, where vehicles are mostly not allowed. 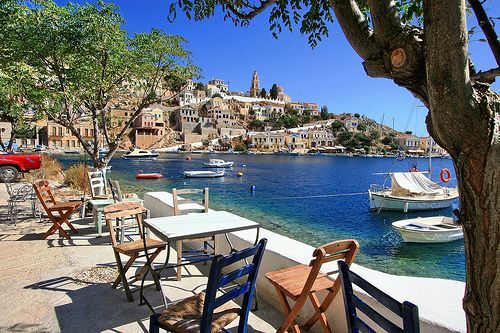 There, you will find many cozy restaurants, cafes and bars, where you can sit right above the sea. It is also worth to explore the inner town, through the narrow streets. There, you will discover interesting shops, more cozy restaurants and a few bars. 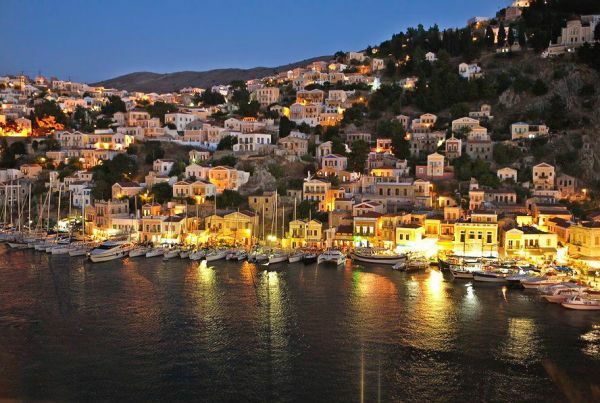 Nightlife in Symi is relatively calm and will not satisfy the party animals. However, often some local tavernas organize Greek Music nights, where the Greek custom of “breaking plates” takes place. 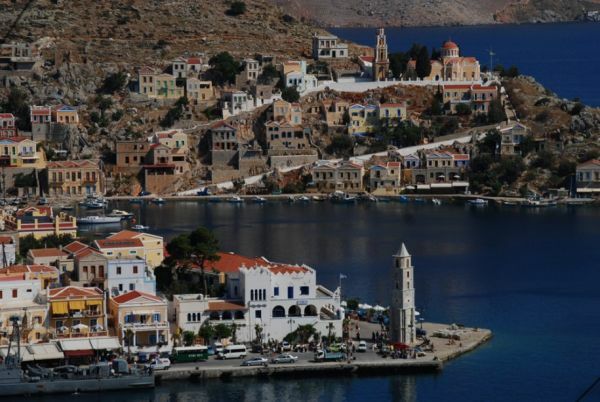 In any case though, Symi is a classy island, attracting upper class tourism. 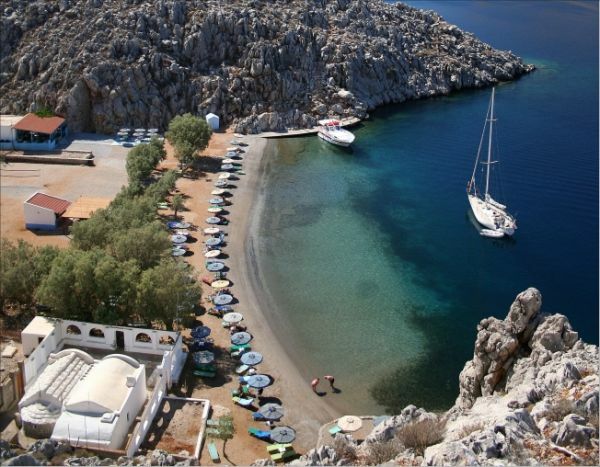 Another advantage of Symi’s town is the sympathetic beach found right in the town, which is allows you to have a chilling dive without having to move your boat. In the town you will also find an interesting Nautical Museum. 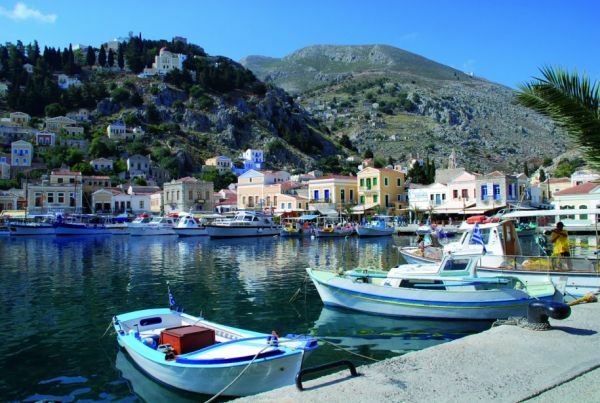 Symi does not have many beaches compared to the other Greek islands. However all of them have wonderful crystal clear emerald waters. 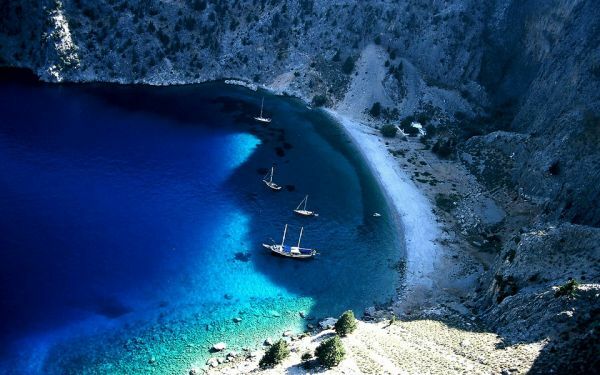 Moreover one of them, Agios Georgios (or Dessalona) is considered as one of the most impressive in Greece, due to its high steep cliffs that end to the beach and its transparent emerald waters. 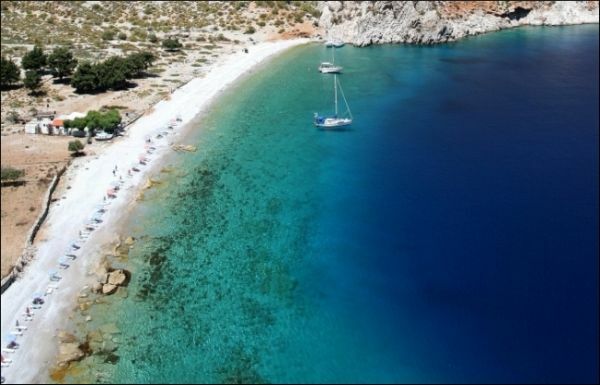 The Nimos islet and the tiny islet of Agia Marina – with the so named chapel – are also popular to yachters due to the amazing transparency of their crystalline turquoise waters. 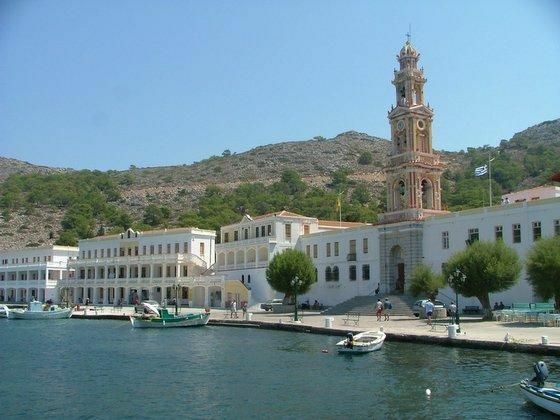 Symi is also famous due to the Monastery of Panormitis, which is found in an almost enclosed impressive bay. 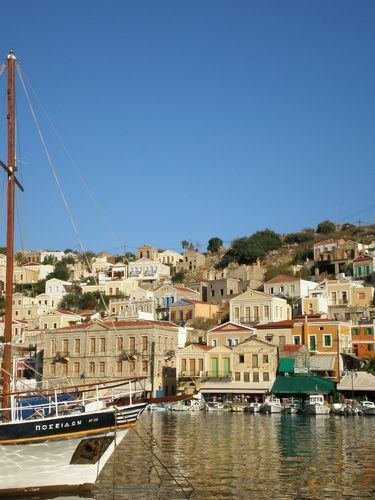 Winds in Symi are much milder than in the Central Aegean, which is an advantage for yachters. However, this causes very high temperatures – mainly in the town- which sometimes become annoying. 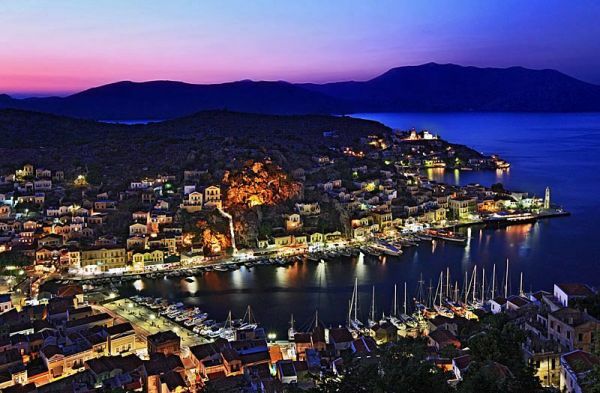 Despite its small size, Symi is considered as a yachting friendly island, mainly due to the quite mild prevailing winds, its’ beautiful anchorages with the crystalline waters and its “jewel”-like port. 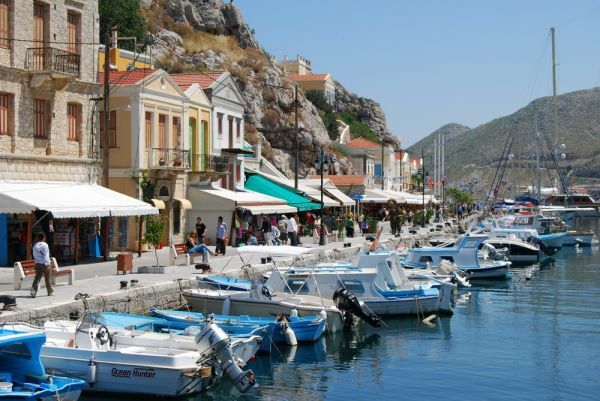 The main port of Symi is often called Yialos and is one of the most beautiful harbors in the Mediterranean. It is quite large, offering many places to moor. However it is very popular and finding a place may be a problem. It is a public port, but there is an attendant dedicated to help yachters to moor. You can also contact him through VHF and he will inform you about the availability of places. A small fee is paid for mooring. The port is well protected from the meltemi but it is problematic with string S winds. The deep sea bottom of mud and rock does not always provide good holding. 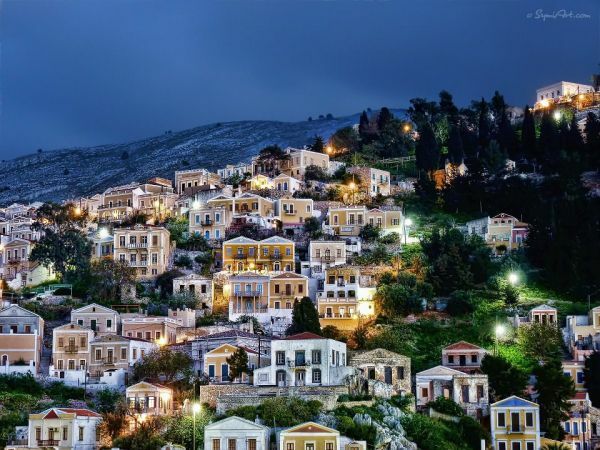 Pedi (Pethi) is a quiet settlement, located in a deep inlet S of the main port and Agia Marina, offering good protection from the meltemi. However, with strong winds it might be gusty. It has a small pier, its sea bottom offers good holding (sand and weed) and refueling is possible as tankers can come to the pier. There is a bus to the main port, a mini market and a couple of tavernas. 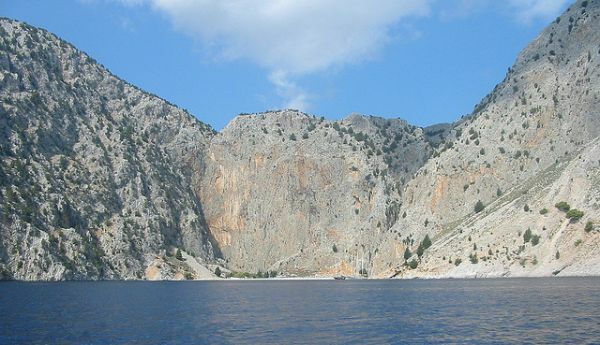 Dessalona (or Agios Georgios) is definitely one the most impressive anchorages, due to its dramatic steep cliffs that ending to a beach with transparent emerald waters. It is well protected from the meltemi but it can be very gusty. It offers quite a good holding in most parts. Keep in mind that an annoying swell may appear sometimes. 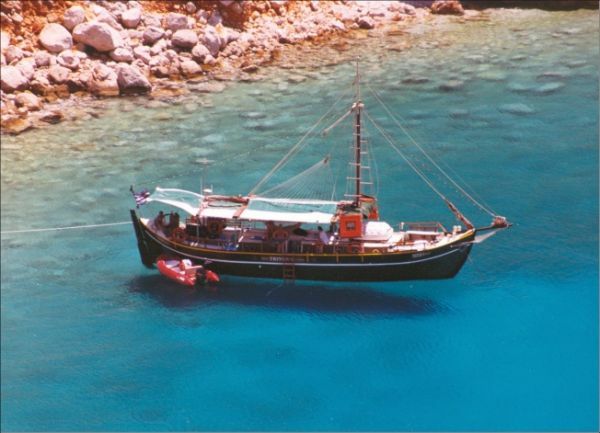 Nanou is another isolated beautiful cove, accessed only by boat or by foot. It offers good protection from most weathers and good holding (sandy bottom). The beach has pebbles (in and out) but its waters are crystal clear with amazing emerald color. You will find umbrellas and a nice taverna close to the beach. Marathouda is a small picturesque cove with crystal clear emerald waters and a few houses, including a beach café. It offers quite a good protection from most winds but it gusts. Sandy sea bottom with some weed. Apx 1 n.m. south of Marathouda you will find the narrow cove of Faneromeni, which also has gusts in the case of strong winds. The place is isolated and the sea is crystal clear. Panormitis (SW) is an impressive bay because it is almost completely enclosed. The place is quite isolated, but is dominated by the large famous so named monastery. Only a few other buildings are found there, including a mini market, a bakery and a taverna. Contrary to the rest of the island, the sea is not as attractive. Panormitis offers very good shelter with the prevailing N winds. With W-WNW there may be an annoying swell and gusts. Holding is good in most spots. Sandy bottom with weed. 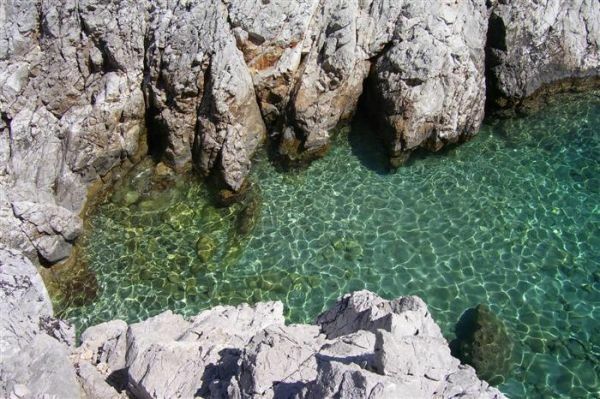 In the western coast you will find the charming cove of Agios Emilianos. It is deserted and provides some protection from the meltemi. 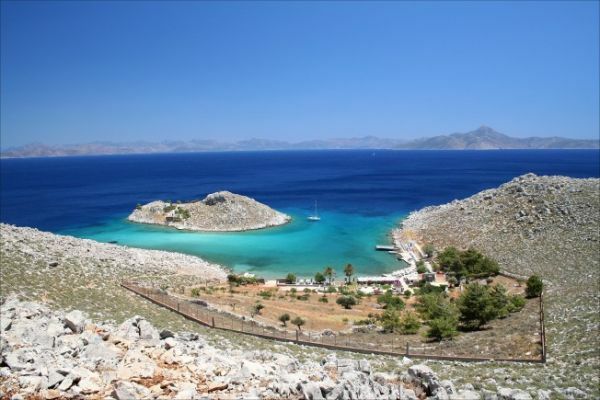 Last but not least do not miss swimming in the amazing turquoise waters of Agia Marina islet and Nimos islet. 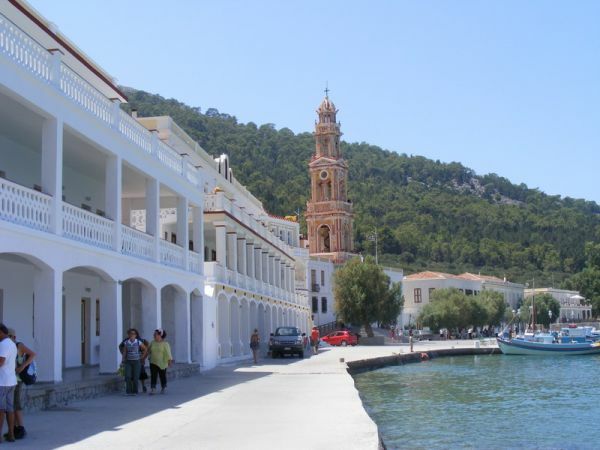 MORE INFORMATION and PHOTOS ABOUT SYMI WILL BE ADDED SOON! Accuracy: This Tourist/Nautical Guide’s only purpose is to offer a totally FREE on-line tool that will assist the Yachting Community. It is being constantly updated by our team, after thorough research and on the spot visits. Additionally, significant voluntary contributions have been offered by respected members of the yachting community. Although we try to evaluate all information as much as possible, www.all4ychting.com, does not have any responsibility for any changes or inaccuracies in its content. Interested to be a contributor? We welcome any information or photo by those who are interested in helping us to improve or correct our content. 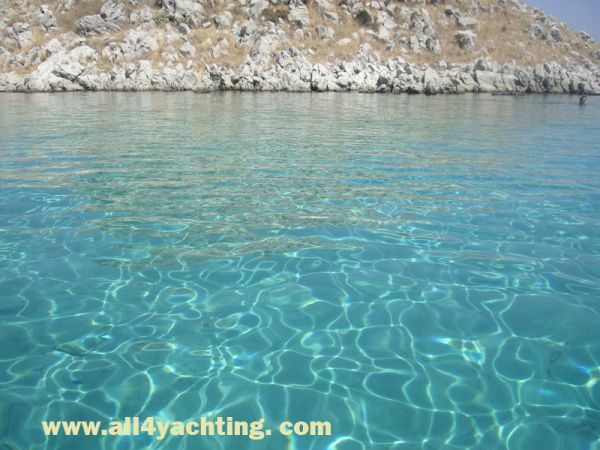 We will be pleased to receive your e-mails at: info@all4yachting.com, with the Subject: Tourist Guide Contribution. Your e-mail, name, surname, telephone number should be clearly stated. Rights: All rights are reserved for any information or photo published in www.all4yachting.com. No one has the right to publish any of the content of www.all4yachting.com without permission. Photos: Most of the photos published in our portal belong to www.all4yachting.com. However, many photos have been sent to us by our contributors. Therefore, we are not able to recognize their source. In case you recognize a photo which is published without permission please inform us by e-mail, as soon as possible. We are willing to publish the photographer’s name, or remove the photo.